Yes, Suits. A remake of that Suits. The Suits a future princess of England stars/starred in. Starring Jang Dong Gun and Park Hyung Sik, Suits is based on an American drama of the same name about a genius college dropout who works in a law firm despite never attending law school. The synopsis for the Korean drama describes the genius as a “rookie lawyer” so I guess they made that change for the remake. This should be a good one for those who like bromances. Jang Dong Gun in his first TV role since 2012’s A Gentleman’s Dignity will play the Harvey character, Choi Kyung Seo (the hotshot lawyer who recruits the genius) while Park Hyung Sik will be the genius, Go Yeon Woo. It’s directed by Kim Jin Woo (Healer, Good Doctor). I’ve seen the first two seasons of the original so this could be great if done well. I thought The Good Wife remake by tvN was a good attempt so let’s hope this follows in its footsteps. 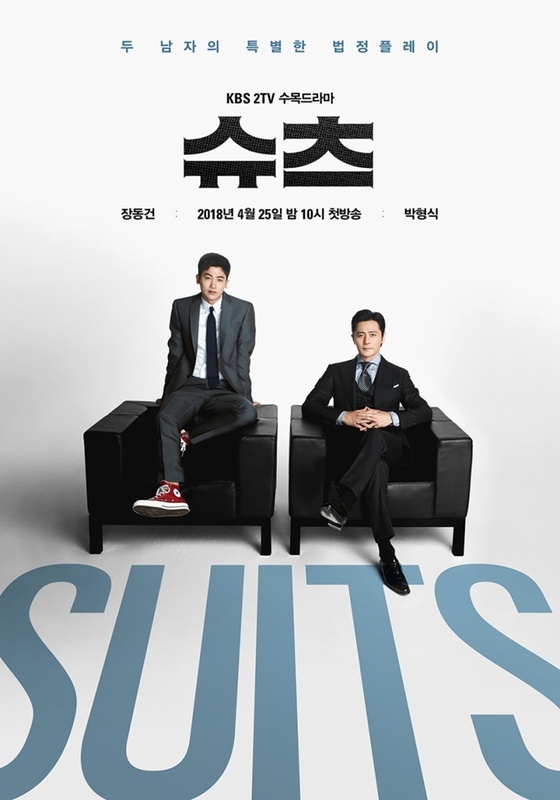 Suits premieres on April 25th on KBS2, and taking over Queen of Mystery 2′s time slot. Typography failure for the title behind them. Looks like SLUTS. LOL Thank goodness the gals didn’t pose for the poster.